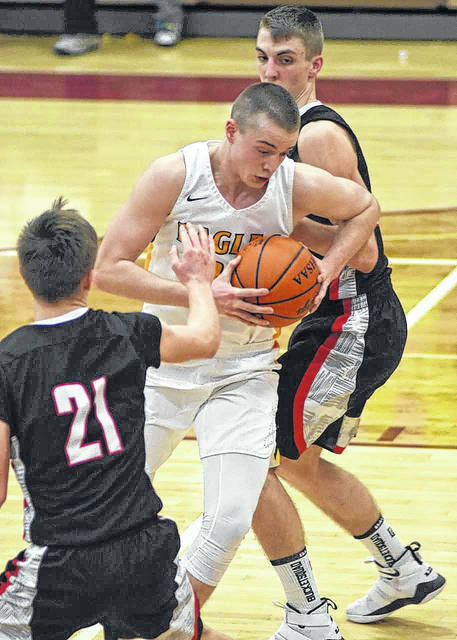 WILLARD — The Colonel Crawford Eagles boys hoops squad laced-up and hit the floor of Willard’s Robert L. Haas Gymnasium to face-off against the Norwalk St. Paul Flyers on Tuesday evening, March 6, in hopes of advancing to a second straight districts finals. Crawford, the No. 2 seed in the Willard District would start the game a bit rocky against the No. 6 Flyers, picking up some quick fouls and committing early turnovers. However, after the first eight minutes of play, the Eagles would find themselves ahead by six points; 16-10. In the second quarter, Colonel Crawford would post an additional 14 points while holding St. Paul to 12 to take the 30-22 advantage into the locker room at halftime. The third quarter proved to be the highest scoring quarter for both teams and was the only quarter in which the lower-seeded Flyers would outscore the Eagles. During what would prove to be their last half of the season, St. Paul posted 20 points in the third but were unable to keep the Crawford offense at bay. Heading into the final eight minutes, the Eagles held a five-point lead; 47-42. In that final eight minutes, Colonel Crawford showed their grit and were able to hold St. Paul to just nine points while posting 14 of their own en route to the 61-51 victory. 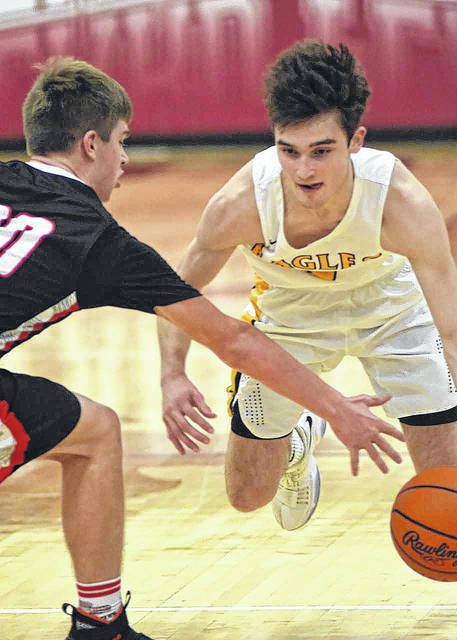 After scoring eight points in the first half, Brody Martin would again lead the Eagles in scoring, posting 21 points after scoring 26 in their sectional championship victory of Sandusky St. Mary’s Central Catholic. Martin shot 6/7 from the interior and 1/2 from beyond the arc to go along with a perfect, 6/6 at the free-throw line. He rounded out his stat line with four rebounds, two steals and an assist in the win. Reis Walker, Jordan Fenner and Harley Shaum all chipped in with nine points apiece to help Crawford punch their ticket to the district title game. Other stats for the Eagles on Tuesday were: Team- 17/28 from the interior, 6/15 from the perimeter, 9/10 at the free-throw line, 28 total rebounds (6O, 22D), 10 assists, 8 steals, 4 blocks and 12 turnovers; R. Walker- 6 rebounds; Fenner- 2 rebounds, 4 assists, 4 steals; Shaum- 9 rebounds, 3 blocks, 1 steal; Cameron McCreary- 7 points, 1 rebound, 4 assists, 1 steal, 1 block; Hayden Bute- 4 points, 2 rebounds and Chase Walker- 2 points, 3 rebounds, 1 assist. The Flyers were led by Chris Ruffing and Nate Winslow with 11 points apiece for the game. Other stats for St. Paul in the loss were: Team- 16/40 from the inside, 2/11 from the outside, 13/17 at the line, 26 total rebounds (14O, 12D), 5 assists, 4 steals, 4 blocks and 9 turnovers; Ruffing- 1 rebound, 1 block; Nate Winslow- 4 rebounds, 1 assist, 1 steal; Nick Winslow- 9 points, 3 rebounds, 1 assist; Nick Lukasko- 9 points, 5 rebounds, 3 assists; Jake Griffin- 6 points, 2 rebounds, 1 steal; Paul Pearce- 5 points, 5 rebounds, 2 steals, 2 blocks and Treg Smith- 1 rebound. WILLARD — Also on Tuesday evening, the two other teams competing for a district title berth took to the floor in a battle of familiar foes. The No. 1 seed, not only in the district but in Division IV, St. Peter’s Spartans clashed with the No. 3 seed Lucas Cubs immediately following the Colonel Crawford/St. Paul game. Being in the same conference (Mid-Buckeye), the Spartans and Cubs played against one another twice in the regular season with St. Peter’s earning the win in both meetings. The Spartans made it a third on Tuesday night, despite an impressive showing from Lucas, by winning 81-71. Lucas’ 71 points are the most scored on St. Peter’s throughout their so far perfect season. On Friday, March 9, Colonel Crawford will clash with St. Peter’s for a district title and a chance to move on to the Division IV Sweet 16. These two squads are set to tip-off at Haas Gymnasium at 7 p.m.
Tickets for the district championship game will be on sale in the Colonel Crawford High School office during school hours Wednesday, March 7 through Friday, March 9 at 12 noon. Tickets are $6 for adults and $4 for students. All tickets at the door on Friday will be $6. Colonel Crawford receives a portion of presale tickets. This game will likely be sold out, so it’s a good idea to purchase tickets ahead of time. In last year’s Division IV, Willard District, the No. 2 seed Colonel Crawford Eagles , defeated the No. 3 seed St. Paul Flyers by a score of 57-49 to advance to the title game. The No. 1 seed St. Peter’s Spartans defeated the No. 4 seed South Central Trojans (defeated by St. Paul in the 2018 tourney) 79-41 to advance to the championship matchup with Crawford. On March 10 of last year, the St. Peter’s Spartans defeated Colonel Crawford by a final tally of 59-42 to claim the district title and move on to the Division IV Sweet 16. The Spartans, 23-2 and ranked No. 2 in the state at that time, marched over North Baltimore; 72-45 to reach the Elite 8. However, the Spartans’ run would end there after being defeated by Delphos St. John’s in the Regional championship game; 44-43. 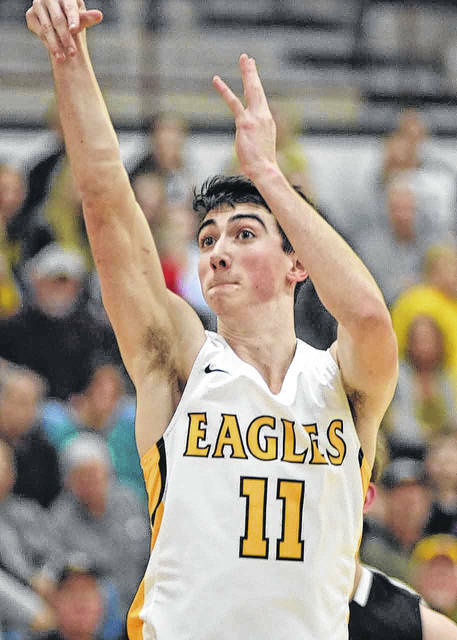 Colonel Crawford senior Brody Martin posted 21 points in Tuesday’s district semifinals against the St. Paul Flyers after posting 26 points in last Friday’s sectional championship game. Eagles senior Harley Shaum muscles his way in the paint during Tuesday’s district semis against St. Paul. Shaum chipped in nine points on the evening as Colonel Crawford advances to the district title game for the second consecutive season. Colonel Crawford sophomore Jordan Fenner scored all nine of his points Tuesday in the second half against the Flyers of Nowalk St. Paul. The Eagles won the district semifinals contest by a final of 61-51.